Earth lost contact with the scientists on Titan, one of the moons on Saturn. You've been sent to check it out. This is my first WAD ever, so you'll notice that the earlier maps aren't as good as the later ones. 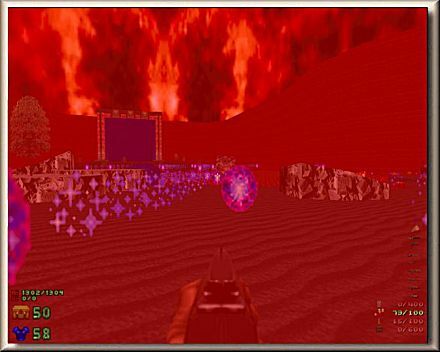 Also it is VERY important that you have at least the 2.0.63a version of ZDoom. 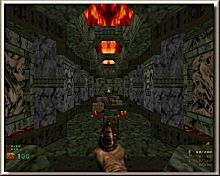 You can get it at www.zdoom.org. seemingly endless. No matter how many you kill, they just come back... stronger every time. discovered that even the rock itself on Titan had begun to change, and that the moon's internal core was bustling with activity. Never knowing when to take a hint, the UAC constructed a mineral storage facility and a laboratory on the moon, intent on figuring out what was going on, and how they could take advantage of it. 2 weeks ago all contact with Titan ceased. Big surprise. This is where you come in. There are some new monsters in Titan, who are also present in the ZDoom Community Monster Pack, although they are modified a bit. The zombie marine I made myself, although it also appears in the Monster Pack. You won't need the Monster Pack with Titan, since the monsters are already in the WAD. This zombie switched his pistol for a chainsaw. Depending on your distance to him, it's either your gain or your loss. Fortunately he's neither fast nor tough. Plus you can always hear him coming. You were wondering what happened to all the other marines. Obviously, they got zombified and hid in some backwater hell pit until now. These bastards fire plasma in your general direction, so get rid of them fast! One clean shot with the super shotgun should take care of them. new ways to abuse energy balls. The Heresy Lord will toss energy balls like there was no tomorrow, and even has a powerful nova attack. If you plan to live, keep your distance. 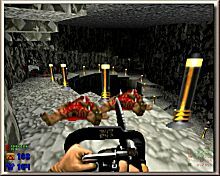 - Map05: I don't agree at all with the cyberdemon which is keeping the yellow key. It's TOTALLY insane!!! Such a decision could be taken if, and only if the plasma gun or the BFG were available, which isn't the case. You have only your double shotgun really efficient and the rockets are killing you as soon as you launch one of them too much closer one of the surrounding structure always moving up and down. I am really pissed off!!! Huge stupidity, and a lack of commun sence. It could be enough to take the decision to stop to play. 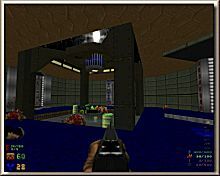 Here, we are ONLY on Map05, and there are still 4 levels after it. So, just in the middle of the game, there is a quasi impossibility to progress, apart for the best of the players, tisons and masters. For the average player, it's really VERY frustrating. There was no beta tester for this pwad?!? At least, they didn't make their job seriously, for sure!!! 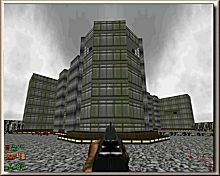 The first 4 maps were really awesome, but I begin to think that the rest of the pwad will be just insanity and pure crazyness made by a tortured brain. - Map06: here is another insanity. I won, ok... Without cheating, ok... BUT: the secrets are a little bit no matter what. For example, there is a shootable switch, above your head where are the mancubus. Once shooted, a door is opened far away at the end of the river of lava, and is closing too much quickly... You have no other choice than to run IN THE LAVA (ridiculous) or to jump and to jump and to jump until you are in front of the door... if you know that there is here a door (and nothing is telling it), and if you don't miss one of the platforms. The "Close delay = 255" don't help you, because you need more time for this "travel" through the lava. Resume: this secret is insane!!! Period! There is also the secret sector 618. Impossible to reach this platform: the jump is not enough efficient!!! We have maybe to fly??? Here is another proof that the beta testers didn't make their job properly: none of them tested the secrets areas, for sure. And I don't talk of the monsters, coming from everywhere. I was able to stay alive with my 6 of life, and to grab, little by little, some more life. But, at the end of the level, I was more pissed off by the difficulty than pleased by the great gameplay, oh yes! Must I talk about the archvile coming suddenly in the arena, at the end, and making a ball of your nerves? And this archvile is available for the 3 levels of difficulty, which is absolutely ridiculous in term of gameplay. How is it possible to put such a monster for the 2 first levels of difficulty?!? 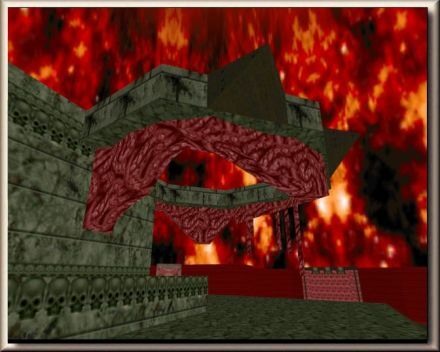 Here again, it's the proof that this map is insane, like the previous one with its cyberdemon, also available for the 3 levels of difficulty, and that nothing was really thought to handle correctly the difficulties. The author tell us that he implemented them, but I can say that he made it no matter how. 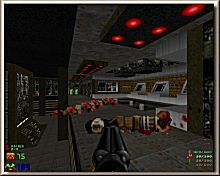 A last comment: there is a secret ABSOLUTELY necessary to find ; it's the one where is hidden the plasma gun. I won without finding it, but I guess that my skill is more higher than the normal player, and this one won't be able to win without it. The author was visibly perturbed for making such a gameplay. LOL !!! Until where I will go further? Until when I will accept such a crazyness? 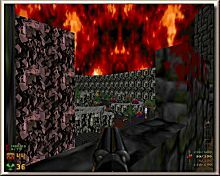 Twice hard than the previous map? You are attacked from every corner, from behind you, from the top, and the right and the left. 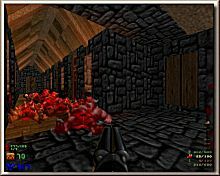 And when you think that you have killed the opponants, some others more hard are teleported, rocketters are attacking you from the other side of the river and the opened area don't allow you to be well hidden. There is no icon of sin, but it's like there was 1 icon hidden somewhere. AWESOME, PERFECT, ABSOLUTE QUALITY, GENIUSLY DONE, GENIUSLY BUILT, THE BEST PWAD EVER MADE SINCE DOOM IS EXISTING. This man is a pure genius!!! One week away, I released what I thought to be THE best pwad ever made ("Purgatory", by James Wilson (aka Shade, the principal mapper of the game Blood, released by Apogee Software), but this one beats it largely. Thus, I thought that it was impossible. 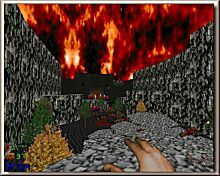 I said about it: "I guess that I'm myself a psycho-doom player... I won after a terrible battle engaging all my skill and my concentration. But, at the same time, I didn't have the feeling to play a nightmare at all." But here, with Titan, it's the absolute nightmare. 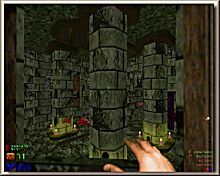 The last level (Map09) is containing 1304 monsters, released as several hords of hundreds of them!!!!!!!!!!!!!! The final Boss (in fact, they are 16) is one of the hardest monster that I had to battle with. You will need to be very strategical, and to think before acting. Be wise enough and you will kill them. "Map32 = 19mn of the most intensive battle that I have ever made during the past 10 years." Hehehe... Here, the last battle ended after 1h09'19'' of an intensive fight, with a few moments of calm. You will have also to warn everyone around you: during your game, you will be VERY nervous... Everybody should leave you alone and to don't talk to you.